A few minutes before her wedding to Derek Dietl (Paul Rudd), a TV weatherman, Susan Murphy (Reese Witherspoon) is hit by a meteorite. The meteorite is infused with quantonium, a rare and powerful element that causes her to grow -- just as she begins to recite her vows -- to an enormous size. Targeted by the government as a monster, Susan is captured and imprisoned at a secret facility where other such oddities are being held, including Dr. Cockroach (Hugh Laurie), a mad scientist who accidentally transformed himself into a roach-human hybrid; B.O.B. 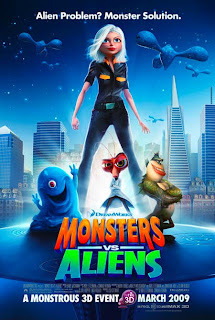 (Seth Rogen), a gelatinous, brainless, but talkative mass brought to life in an experiment gone wrong; the Missing Link (Will Arnett), a Creature-from-the-Black-Lagoon-like lizard man; and the skyscraper-sized mutant larva Insectosaurus. Their jailer is General W.R. Monger (Kiefer Sutherland). When deranged alien overlord Gallaxhar (Rainn Wilson) comes to Earth to obtain the precious quantonium and conquer the world, U.S.
barbecue. Derek doesn't attend. When Susan seeks him out, he breaks up with her; it's apparent that all he cares about is his career, and he doesn't think a 50-foot wife will help him move into larger markets. Susan quickly realizes that she's better off without Derek, and that she likes her new self, her new abilities, and her new friends. She rejoins the other monsters only to be snatched up into Gallaxhar's spaceship. Insectosaurus is felled when it tries to help her. Despite Susan's brief escape and determined resistance, Gallaxhar extracts the quantonium from Susan's body and she returns to her original dimensions. The quantonium is key to Gallaxhar's evil plan to take over the world: it enables him to create legions of clones, who march around in formation saying "Hail Gallaxhar!" Meanwhile, the surviving monsters have snuck aboard to help Susan. They send the ship into self-destruct mode. Only Susan makes it out of the engine room before the doors close; Dr. Cockroach, B.O.B., and the Missing Link, stuck inside, insist that she escape without them. But Susan is made of tougher stuff than that; she goes back to Gallaxhar and tries to make him abort the self-destruct and release her friends. When Gallaxhar tries to escape, Susan regains possession of the quantonium and becomes a giant again. After she frees her friends, they're all rescued from the self-destructing ship by General Monger and Insectosaurus, who wasn't dead after all -- just busy metamorphosing into a moth the size of a 747. Before Susan and the monster squad are called away to save another day, there's a big celebration during which Derek tries to interview Susan. She spurns him and allows B.O.B. to swallow him and spit him out, a career-killing moment that Susan makes sure will be caught on camera. enter a machine that extracts the quantonium from her body, shrinking her to her normal size. leap out of the exploding spaceship and are rescued by General Monger on the back of the revived Insectosaurus, who had sealed his body in a cocoon and transformed into a giant butterfly. The monsters receive a hero's welcome upon their return. Derek attempts to get back with Susan for the sake of interviewing her, which could benefit his career; instead, Susan rejects him and forces him to endure the humiliation of being thrown into the air and caught, swallowed and spit out by B.O.B. on camera. At that moment, the monsters are alerted to a monster attack near Paris and fly off to combat the new menace.